Collins was born in Louisiana. He graduated from West Point in 1917 but saw no combat in the First World War. 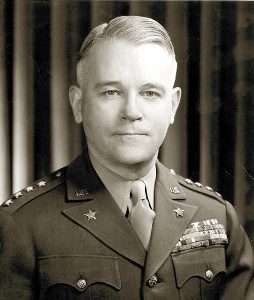 Between the wars, he attended most of the Army’s command training schools, including the Infantry School (where he later served as an instructor), the Command and General Staff School, the Army Industrial College, and the Army War College (where he also served as an instructor.) He also served a tour in the Philippines. Blessed with "quick wits and a steely will" (Perret 1991), Collins was one of the best Army tacticians. He had helped develop the triangular division concept and had revised the Army’s close order drills. He was a Marshall protégé and one of the best field commanders in the war. Collins was the chief of staff of the VII Corps in Alabama at the outbreak of war. Made chief of staff of the Hawaiian Department immediately after the attack on Pearl Harbor, he was subsequently promoted to brigadier general in February 1942 and to major general in May 1942. He commanded 25 Division in the Guadalcanal and New Georgia campaigns. Here he received his nickname, "Lightning Joe," from the telephone code for his headquarters, "Lightning," and his driving command style. Collins refused hospitalization for malaria during the Quadalcanal campaign, and this resurfaced at New Georgia, where he also suffered from gastoenteritis. MacArthur considered Collins too young for the three stars of a corps commander, but Marshall was able to persuade Eisenhower to give Collins command of VII Corps for the Normandy invasion, and he was transferred to Europe in March 1944. He distinguished himself there as a corps commander, and the German generals later identified him as one of the two best American corps commanders they faced. This opinion has been largely shared by historians (e.g. Taaffe 2011). His command style combined aggressiveness with tactical finesse, flexibility, emphasis on good intelligence, and close supervision of his subordinates, towards whom he was ruthless if they failed. Collins was chief of staff of the U.S. Army during the Korean conflict and served as a special representative to Vietnam before his retirement in 1956. Graduates from Military Academy, standing 35th in a class of 139, and is assigned to 22 Regiment.